^ Inc, Encyclopaedia Britannica (1 March 2009). Britannica Guide to India. Encyclopaedia Britannica, Inc. p. 57. ISBN 9781593398477. ^ "Pandya dynasty | Indian dynasty". Encyclopedia Britannica. Retrieved 21 September 2017. ^ A. Soundaram (2011). "The Characteristic Features of Early Medieval Tamil Society". In S. Ganeshram; C. Bhavani (eds.). History of People and Their Environs. Bharathi Puthakalayam. pp. 68–69. ISBN 978-93-80325-91-0. ^ Melton, J. Gordon (15 January 2014). Faiths Across Time: 5,000 Years of Religious History [4 Volumes]: 5,000 Years of Religious History. ABC-CLIO. p. 476. ISBN 9781610690263. ^ Avari, Burjor (1 July 2016). India: The Ancient Past: A History of the Indian Subcontinent from c. 7000 BCE to CE 1200. Routledge. p. 249. ISBN 9781317236733. ^ Ramaswamy, Vijaya (25 August 2017). Historical Dictionary of the Tamils. Rowman & Littlefield. p. 9. ISBN 9781538106860. ^ University, Vijaya Ramaswamy, Jawaharlal Nehru (25 August 2017). Historical Dictionary of the Tamils. Rowman & Littlefield. p. 50. ISBN 9781538106860. ^ Shulman, David Dean (14 July 2014). Tamil Temple Myths: Sacrifice and Divine Marriage in the South Indian Saiva Tradition. Princeton University Press. p. 124. ISBN 9781400856923. ^ Benard, Elisabeth; Moon, Beverly (21 September 2000). Goddesses Who Rule. Oxford University Press. p. 41. ISBN 9780195352948. ^ Roy, Kaushik (3 June 2015). 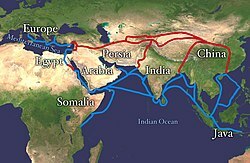 Warfare in Pre-British India – 1500BCE to 1740CE. Routledge. p. 55. ISBN 9781317586920. ^ Ramaswamy, Vijaya (25 August 2017). Historical Dictionary of the Tamils. Rowman & Littlefield. p. 260. ISBN 9781538106860. ^ "Pandya dynasty | Indian dynasty". Encyclopedia Britannica. Retrieved 1 February 2018. ^ Connolly, Peter; Gillingham, John; Lazenby, John (13 May 2016). The Hutchinson Dictionary of Ancient and Medieval Warfare. Routledge. p. 100. ISBN 9781135936747. ^ Puri, B. N.; Das, M. N. (1 December 2003). A Comprehensive History of India: Comprehensive history of medieval India. Sterling Publishers Pvt. Ltd. pp. 90–91. ISBN 9788120725089. ^ Rajan, K. V. Soundara (1 March 1998). Rock-cut temple styles: early Pandya art and the Ellora shrines. Somaiya Publications. p. 58. ISBN 9788170392187. ^ Mansingh, Surjit (9 May 2006). Historical Dictionary of India. Rowman & Littlefield. p. 430. ISBN 9780810865020. ^ Shastri, Ajay Mitra; Kumar, Manmohan S. (1 January 1996). Numismatic Studies, Vol. Harman Publishing House. p. 46. ISBN 9788185151922. ^ Iyengar, P.T. Srinivasa (2001). 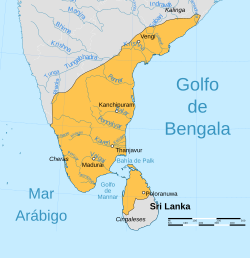 History of the Tamils: From the Earliest Times to 600 AD. Asian Educational Services. p. 22. Retrieved 15 July 2007. ^ Caldwell, Robert (1881). A Political and General History of the District of Tinnevelly. p. 20. Retrieved 15 July 2005.